The Stream – Dig Delve – An online magazine about gardens, landscape, growing & making. The leaves are nearly all down in the wood, winter light fallen to the floor for the first time in half a year. A new horizon meets us as we look out from the house. Not onto the weight of the poplars and their understory, but through to the slopes beyond. The tracery of branches clearly identifying one tree’s character from the next, the tilt of trunks, the hug of shining ivy. Everywhere the scale change is remarkable and we find ourselves drawn out into the landscape with refreshed curiosity. Much of this is simply to do with a season’s growth dropping back into dormancy. Under the elderly field maple in the clearing by the stream a coppery skirt lies in a circle where the leaves fell in the still air there. 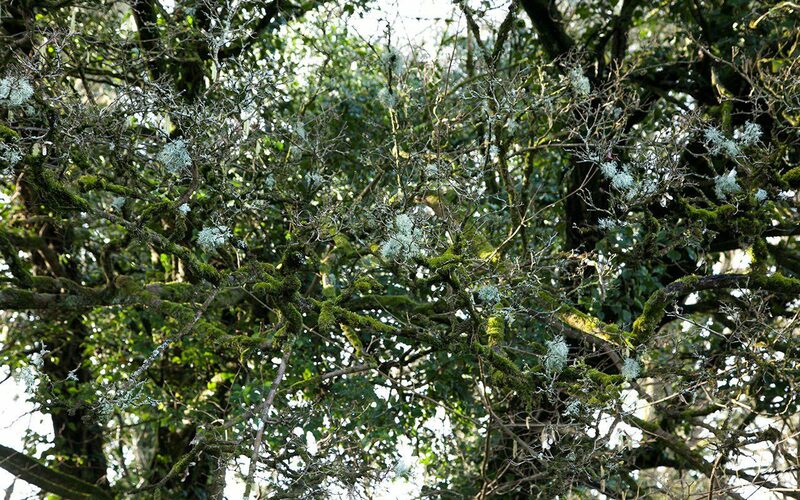 Looking up into the newly naked branches a world of lichens and moss – grey, silver and green – has made them home. The nettles that just a month ago were lush and keeping us from the stream have half their volume. With continued frosts in the hollow they will be nothing but brittle stem in a month and we will be free to walk its length once again. The stream is audible from up by the house in all but the driest weeks, but now it is charged with winter rain and the noise pulls us down to look. 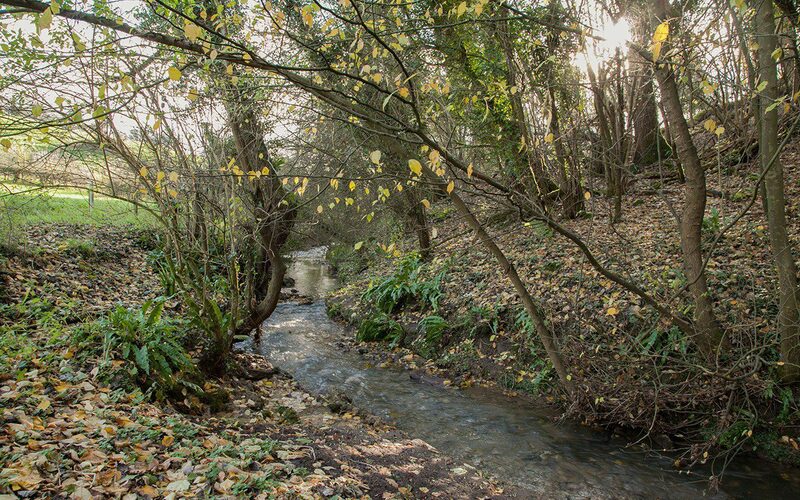 You can easily lose an hour or more if you start to explore the mud and shingle banks, as the stream landscape is always changing. 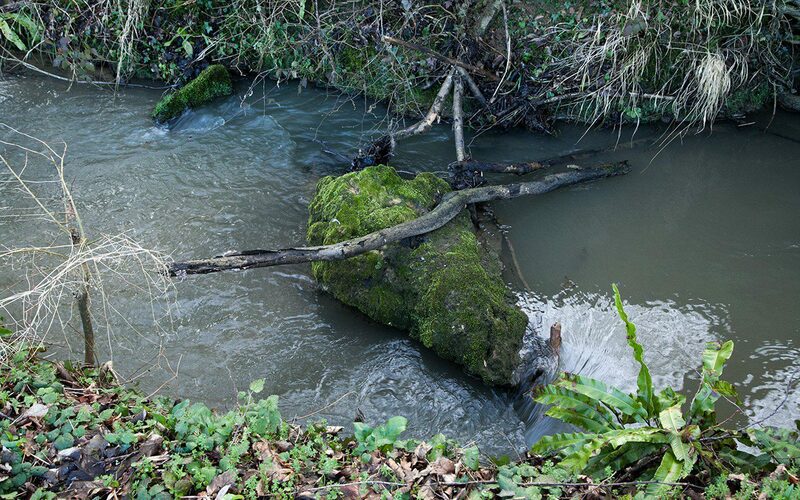 A log from higher up, driven down by storm water, causing damming and silting up, contrasts with the constancy of a favourite boulder, marooned in a pool of its own influence, a home to moss and liverworts. 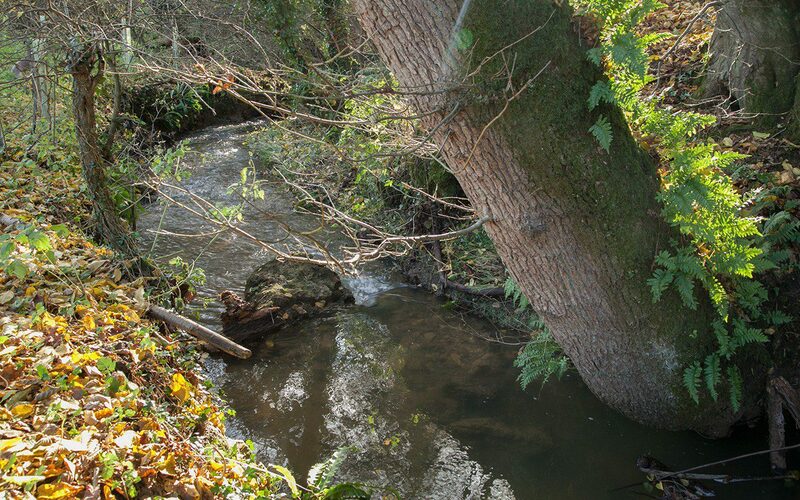 Although the stream is small and at times hidden, it is a favourite part of the property. Soon after moving here at about this time of year we started bank clearance and every year we have done a little more. A barbed wire fence that ran its length to keep the animals in the fields is all but removed now, the rusty coils disentangled and pulled free of the undergrowth and the rotten fence posts removed. As a reminder a number of oak posts that outlived the softwood ones were left to mark the old fence-line. They are now cloaked in emerald moss and, when working in the hollows, are perches for watchful robins. In places the stream disappeared into a thicket of bramble to emerge again lower down without revealing its journey. 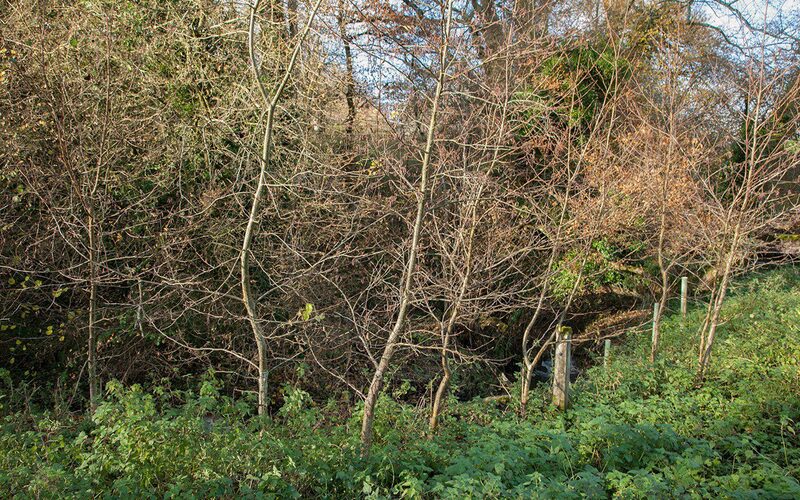 The child in me had to know what lay within and the mounds of bramble that bridged the banks were cleared to reveal, in one case, a lovely bend and, in another, a pretty fall and outlook where I have planted a small Katsura grove. I have plans to make a shelter there for watching the water when the trees are grown up, but for now it is simply enough to have the plan in mind as a potential project. Slowly, and in tandem with the clearances, I have started to plant the banks on our side where the farmer had taken the grazing right to the very edges. 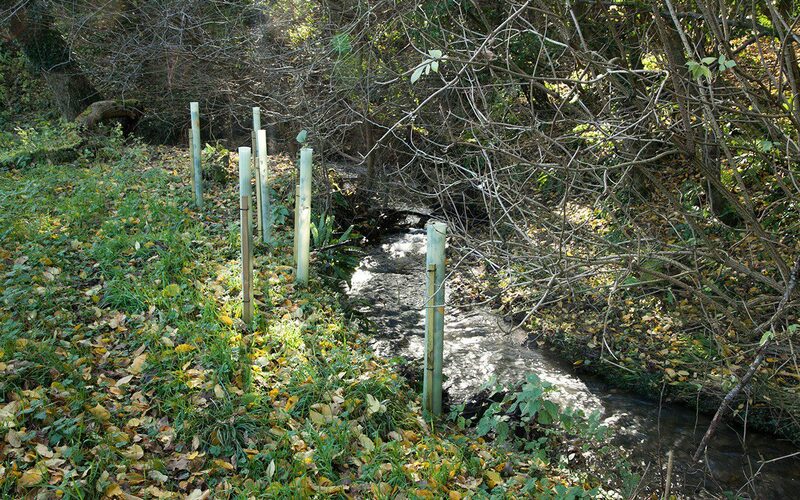 Although we do not want to lose the stream behind trees for its entire length, it is good to balance the volume of our neighbour’s wood on the other side and, in places, to protect the banks. 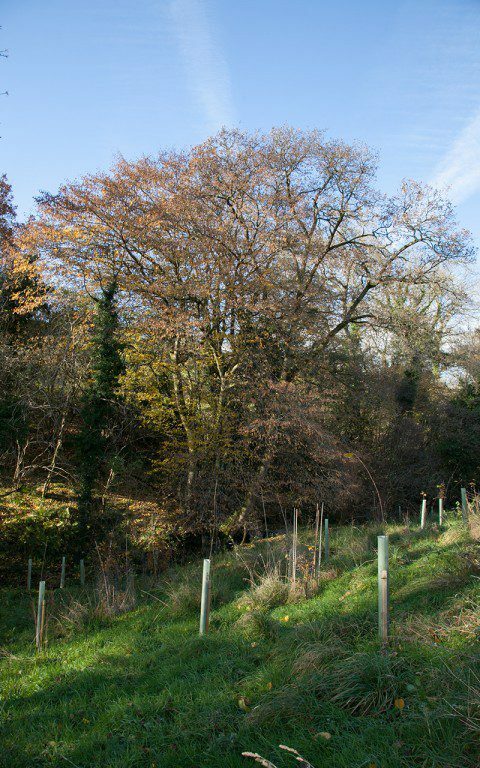 The new trees, just sapling whips at the moment, have been planted so that we can weave in and out of their trunks on the walk up or down the stream and with or against the flow. Tree planting is one of my favourite winter tasks. The young whips are ordered in the autumn and are with us from the nursery not long after the leaves are down when the lifting season starts. If I can I like to get them all in before the end of the year so that their feeding roots are up and running by the spring when top growth resumes. Alder (Alnus glutinosa), a riverine species that likes to dip its feet into the water, is one of the best for stablilising the banks. 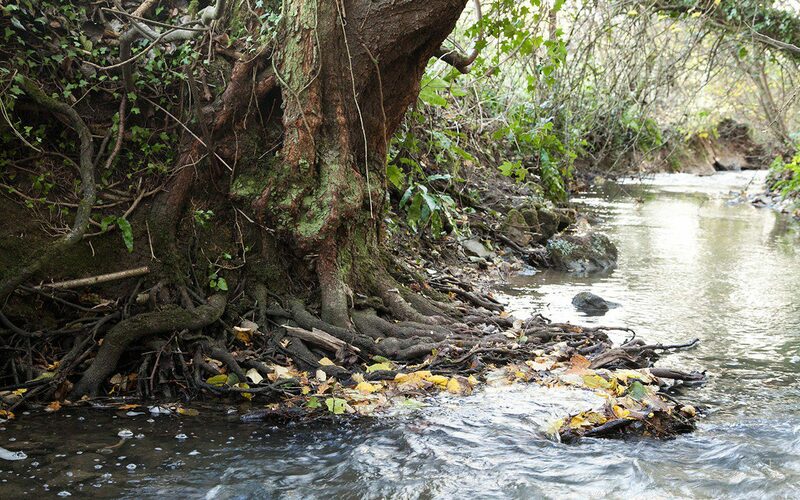 The roots, which produce their own nitrogen and charge young trees with vigour, are dense and mat together to form a secure edge where the banks are crumbling from having no more than pasture to hold them together. The deer that have a run in the woods have loved the young growth so, after a year of grazing which left them depleted, I have resorted to using more than spiral guards to protect them. The cylindrical guards are not pretty to look at, but give the saplings long enough to jump up above the grazing line and gain their independence. In the deeper shade of the overhanging wood, and where the alders have proven to be less successful, I have used our native hornbeam (Carpinus betulus), encouraged by a mature specimen that, together with an oak, teeters on the water’s edge. It too has a dense root system and loves the heavy clay soil on the banks that lead to the water. 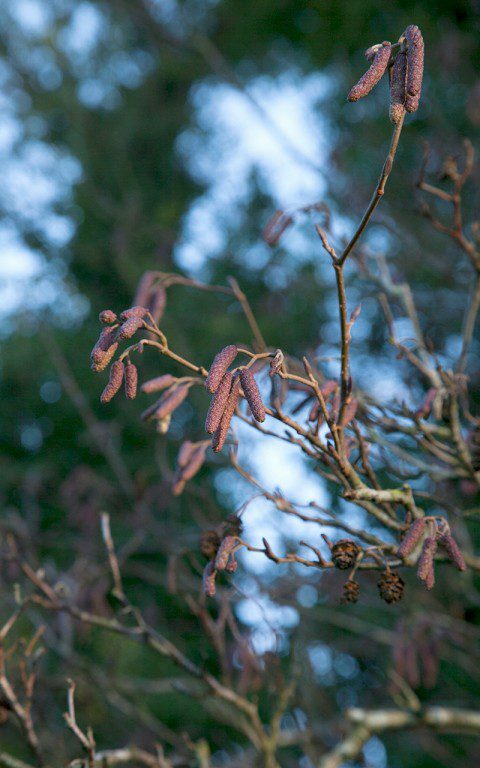 Both the Carpinus and the Alnus have good catkins, which are in evidence already on the alders. Purple-brown and already tightly clustered, with hazel they are the first to let you know that things are already on the move in early winter. 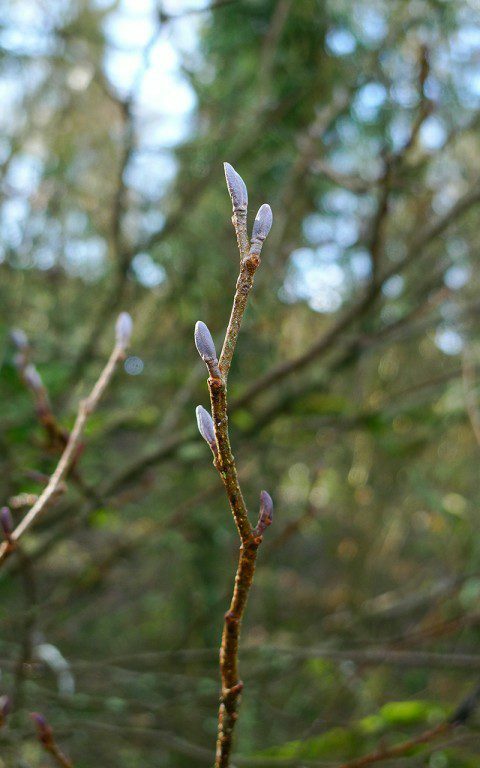 The alder buds are also violet and your eye is pleased for the colour which is intense in the mutedness of December. 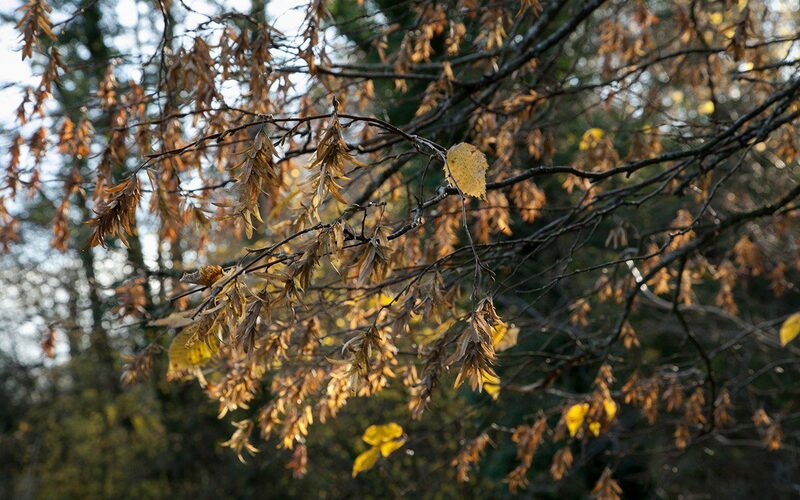 The keys of the mature hornbeam are still hanging in there and glow russet in the slanting sun that makes its way down the wooded slopes. After winter rains the stream rushes in a torrent that would sweep you away if you tried to wade across it, so this winter the stream work will turn to the bridges. Firstly to clear the remains of a stately oak that fell under the weight of its June foliage and then on to repair the clapper bridge that we made a couple of years ago and which was washed away in the heavy rains just recently. For now the fallen poplars, with their perilously mossy trunks, provide the link to the wood from which they fell. One came down the first summer we were here, and another two years later. 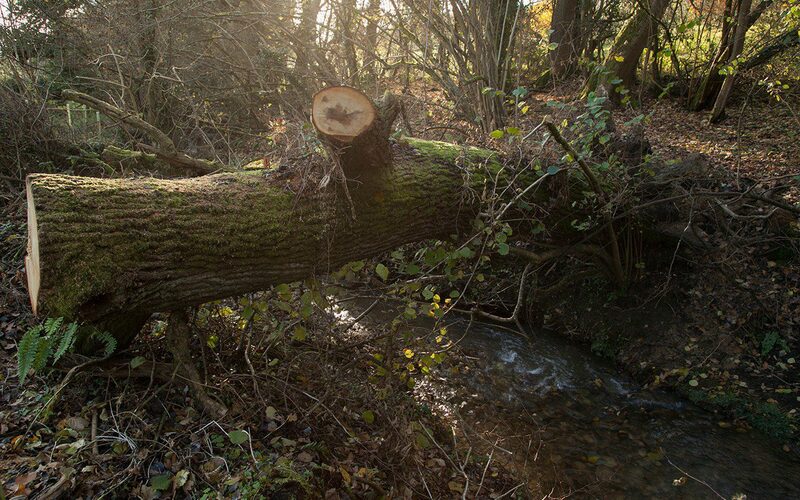 Now the fallen oak has changed the stream once again and with it our winter diversions.